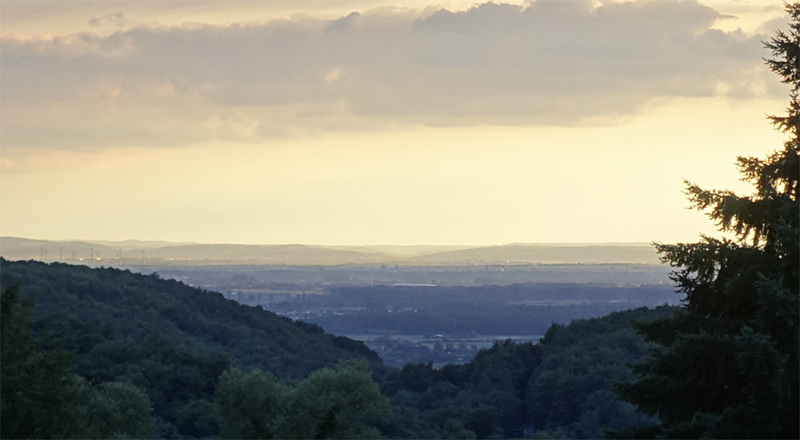 View unto the Rhine Plain with Worms on the horizon (22 km), "Jerusalem on the Rhine" in the High Middle Ages. After the Jerusalem Friedensmal had already been built, I learned of a new initiative from the cities of Worms, Speyer, and Mainz, which had applied to UNESCO for recognition of their Jewish past as a World Heritage Site. This Jewish heritage had not been known to me before. From the Circle of Peace on the hill you look down onto this area, which is even called "Jerusalem on the Rhine"; what a coincidence! All of a sudden, the name I found from the inner meaning of the monument was given an external meaning through life itself. The roots of the Tree of Life within the Circle of Peace point towards Jerusalem in the East. The Rose of Shalom is located at the heart of the Tree of Life. 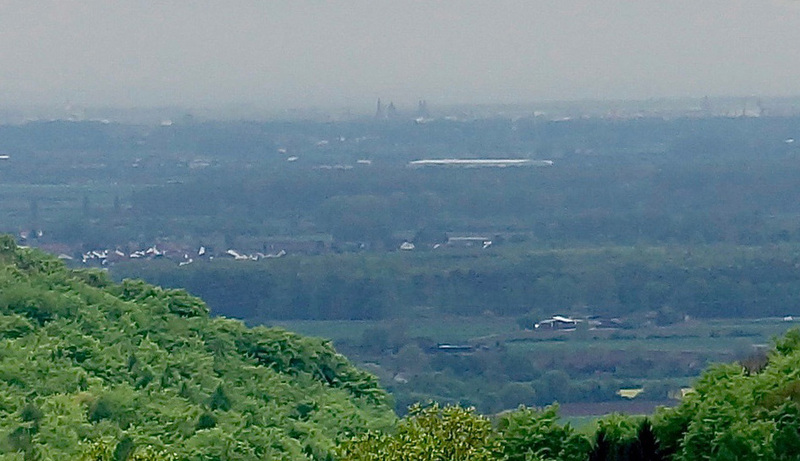 Looking west from the place, between the two hills, the silhouette of the city of Worms can be seen in the Rhine Plain, with its large cathedral on the horizon. Worms is the geographical middle of the three cities Speyer, Worms and Mainz, who formed in the high Middle Ages Jerusalem on the Rhine” (film in German, ZDF, 45 minutes). In Jewish sources, the three cities of Speyer, Worms, and Mainz were named for the initial letters of their Latin names SchUM-Cities. Because of their vital importance for the Jewish congregations in Central Europe, they are considered the birthplace of the Ashkenazi Jewish culture in the High Middle Ages. The SchUM culture was devastated by the persecution of the Jews and the destruction of their congregations during the Crusades. In modern Jewish historiography, this is generally referred to as the first anti-Semitic event that resulted in unforgettable consequences with the Shoah at its climax (reference). At the center of the image, between both hills, the cathedral in Worms can often be seen with the naked eye. The Jerusalem Friedensmal is a positive example of a forward-looking commemorative culture. A future in dignity and freedom is possible if we confront the past. It means making peace with the past because a responsibility for it comes into being in the present. With regard to the Schum-Cities you can see the coherences that have been reflected in history for a long time. This project relates to the fundaments.The very beginnings of the Jewish-German relationships need both recognition and peace. 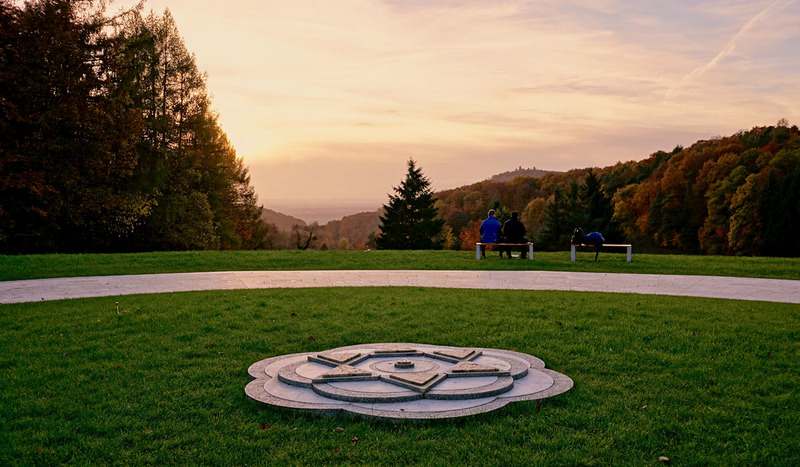 A view from the Rose of Shalom within the Circle of Peace. The cathedral is clearly visible with binoculars. The atrocities in the German relationship to Judaism are going way back. The SchUM culture in the cities Speyer, Worms, and Mainz on the Rhine was so important that the current application of these cities to become “World Heritage” seems appropriate. On their way towards Jerusalem in Israel, Christian Crusaders passed through the SchUM cities in 1096, which was then known as “Jerusalem on the Rhine”. Jews who were not willing to convert to Christianity were massacred. The Crusaders left behind a trail of destruction. The years that followed witnessed many pogroms against the Jews, shortly after the Third Crusade in 1195, as well as in 1282 and 1343 (reference). The German pogroms between 1348 and 1351, as the country was suffering from the plague, should also be mentioned. The population blamed “the Jews”, who were suspected of poisoning the wells. Jews fell ill less often thanks to their better hygiene, as they followed their religious rules.